Male / Female; Must have RED CROSS Certificate and Training; Willing to render overtime and work with or without supervision; Willing to be assigned in the jobsite and start anytime. Graduate of BS Nursing; With PRC License / Certificate; Ability to work unsupervised, Self- motivated and with mature disposition when handling work pressures. Must have NCII; Willing to render overtime and work with or without supervision; Willing to be assigned in the jobsite and start anytime. Male; Graduate of any 4 years course / College level; Computer literate; Knows how to drive forklift or 4 wheels and with Driver’s License; Knowledge in rendering First Aid. Female; Bachelor’s Degree in Fine Arts, Graphic Arts, Multimedia or any related courses or equivalent work experience of minimum of 4 years in the field of computer graphic design and illustrator; Good photo editing skills; Good knowledge in creating and maintaining computer networks, installing and updating software packages, basic hardware maintenance; Excellent English communication skills; Good interpersonal skills and outstanding work ethics; A fast learner and able to adapt to changes as necessary. At least 5 years working experience or more; With knowledge in landscaping, grass cutting and maintenance. Preferably graduate of BS Industrial Technology, BS Mechanical Technology or any related course; With experience in Production or in any manufacturing company; Familiar in operating Surface Grinding Machine, Electric Discharge Machine, Milling Machine, NC Milling machine, vertical bandsaw, NC wirecut machine; With good communication skills both oral and written; work experience related to tool and die maintenance is an advantage; Computer literate (MS Office, Word, Excel). Male / Female; Graduate of BS in Electronics and Communications Engineering, Computer Engineering or Information Technology; With good interpersonal and communication skills; Computer literate and highly trainable; With good scholastic record; Analytical, Flexible, Assertive and have passion to work; Willing to render overtime, work on weekends and holidays. Male / Female; Graduate of BS Accountancy / BSBA-Accounting; With good interpersonal and communication skills; Computer literate; Good knowledge of Microsoft Word, Power point, and Excel; Highly trainable; Willing to be trained and learn new process/techniques; Analytical, Flexible, Assertive and have Passion to work; Can work with minimum supervision; Capable of accepting / handling work pressures. 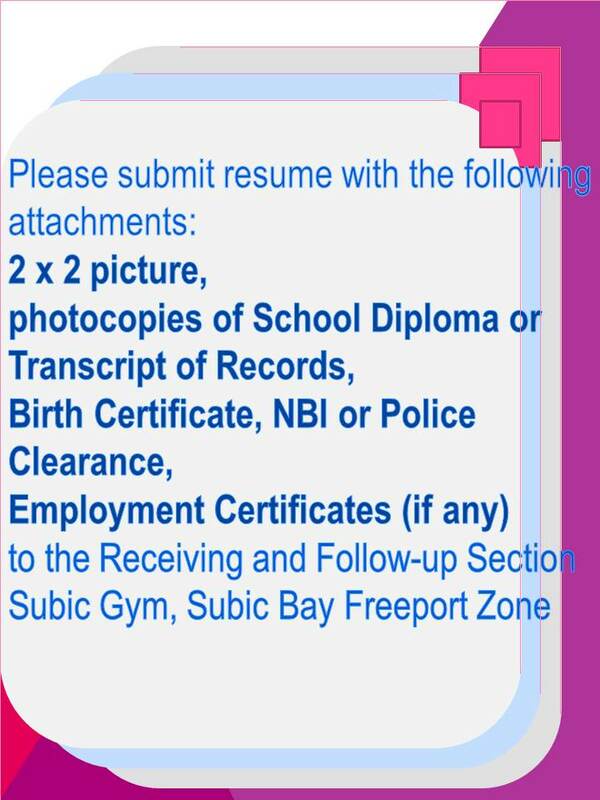 Applicants are advised to register at the Receiving Section, Subic Gym on/before SEPTEMBER 25, 2017 before proceeding to the Wistron Infocomm (Philippines) Corporation located at #4 Rizal Highway corner Aim High Avenue, Subic Bay Gateway park, Subic Bay Freeport Zone, from Monday to Friday, 10:00am (Exam) and 1:30pm (Interview) and look for MS. CRISTINA LIM. College level; Computer literate; Flexible. At least two(2) years in College; Computer literate; Flexible. Male; Must have valid Professional Driver’s License with restriction code no. 8; At least 2 years related experience as Trailer Driver is preferred; Can handle the towing, delivery, launching, retrieving of Speedboats; Familiar with Manila routes up to Batangas; Physically fit to work; Can handle long hours of driving; Have good attitude towards work, trustworthy and dependable; At least 5 years related working experience. Male; Must be an experienced seat, sofa, beddings, etc. upholsterer. Male; Mechanical / Technical graduate or any related course; With 2 – 3 years of experience on the field of marine engine; Confident and with strong drive to work; Willing to travel all over Philippines; Can handle pressure and with good analytical skills; Goal-oriented, hardworking and persistent.